Ideal Body Mass Index Weight? Your Ideal Body Mass Index Weight? 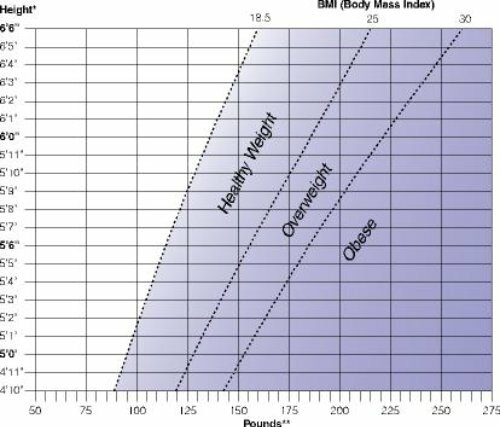 Can this BMI chart be used to find your ideal body mass index weight? Actually this chart is not the best place to find your ideal weight. As has been mentioned on the page "Ideal Body Weight Chart" the best places to find your ideal weight are ideal body fat percentage , Ideal Body Measurements for Women and, Ideal Body Measurements for Men. Think of BMI as a way to find a healthy weight. Body Mass Index Charts are best used to find healthy weights and to set goals for getting out of obesity. The BMI was designed by doctors to mathmatically describing the average shape of a body. It is simply the weight in kg divided by the height in meters squared. Because this body mass index weight chart by the national institute of health has lines that indicate the level of obesity, these lines can be your intermetent goals to getting out of obesity. Just remember that when you are obese, every pound lost will make you healthier.